After the atomic bombs were dropped, but before a Japanese surrender had been negotiated, V Bomber Command was busy moving troops and equipment to Okinawa. The 22nd and 43rd bomb groups were also enlisted to ferry troops, as all the C-46s and C-47s were already in use. 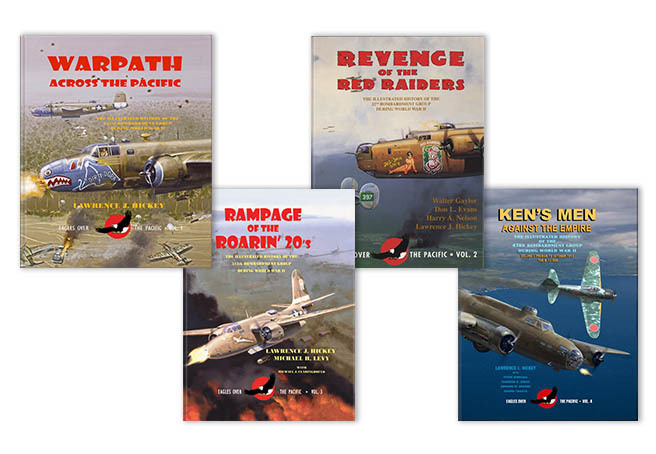 While the B-24’s potential as a troop carrier may have looked good on paper, the logistics behind turning these bombers into transport aircraft subjected passengers to a potentially deadly situation. The ideal location for extra passengers would have been closer to the tail of the aircraft, but that would make the plane much more difficult to fly. Instead, passengers had to ride on precarious wooden seats installed in the bomb bay. The 11th Airborne Division was selected to drop onto Atsugi Airdrome as part of the Army of Occupation if the Japanese were to surrender. First, though, they had to be moved from Luzon to Okinawa. 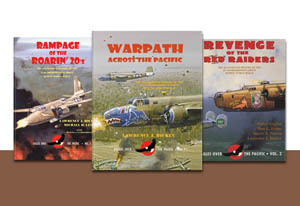 Ten B-24s from the 22nd Bomb Group were sent down to Luzon for the move. 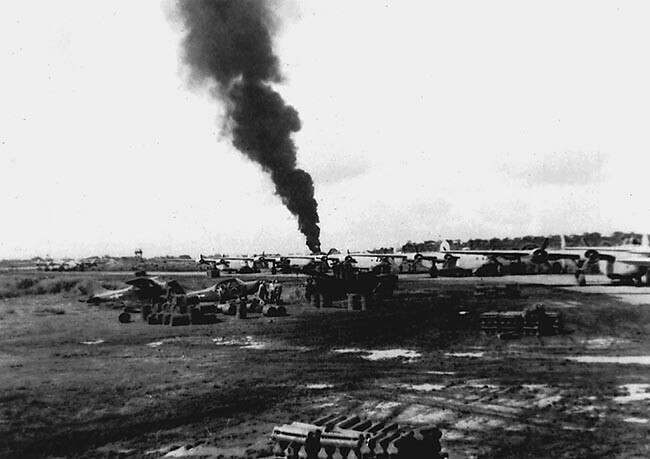 The 11th Airborne Division was spread out among four airfields, and the 22nd would transport the 511th Regiment waiting at Lipa, located south of Manila. Each of the B-24s were loaded with 20 paratroopers and their equipment and rumbled down the runway one at a time. The first dozen took off without incident. LADY LUCK did not. Captain Jack L. Cook didn’t notice any issues with the aircraft as he taxied to the runway. The #1 engine took longer to reach full power, which was unusual. Still, LADY LUCK reached takeoff speed and Cook attempted to lift the nose off the runway, only to feel a huge amount of drag that kept the nose on the ground. He was very quickly running out of runway and still couldn’t lift off. After hitting a small tree at the end of the runway, Cook noticed the airplane gaining speed and hoped once again that he could take off. In a split second, that hope was dashed to pieces when the right wheel struck a ramp 100 feet beyond the official end of the runway. The landing gear was driven through the wing and fuel line, subsequently setting LADY LUCK on fire. What remained of the fuselage was broken into pieces. None of the men in the cockpit had serious injuries and all were able to climb out of it. The fire in the fuselage would kill 11 of the paratroopers on board. Three more would have died if not for the heroic efforts of Lt. Hoadly G. Ryan, who ran into the burning plane twice to rescue whoever he could. Others followed his example and saved a few more lives. As for the cause of the crash, Cook first suspected the runway was too short. The day after the accident, he and his co-pilot went back to the scene and noticed two parallel black lines going down the runway. Both of them immediately knew that the brakes must have locked on and kept LADY LUCK from gaining sufficient speed to take off. How or why that happened remains a mystery. Read this story in our book Revenge of the Red Raiders. A very tragic day indeed. Especially so close to the end of the war. What a dreadful end to the war for so many young men! In 1945 and 1946, hundreds and hundreds of lives were lost transporting people in the bomb bays of Lancasters and Halifaxes. The biggest RAF loss of female personnel ever, still remains a Lancaster with a complement of nurses on board off Corsica. How awful! Do you know what was determined to be the cause of the accident? No, nobody does. A distant flash on the horizon was noted by another aircraft but nothing was ever found, no wreckage, no bodies, no oil stains, nothing. Between September 29th 1945 and December 31st 1946, a total of 529 British lives were lost in similar incidents, a lot of them ex-POWs. What was the cause of the loss of the Lancaster? It’s hard to say. Given how full the plane was, maybe they figured it was handling differently because of that? We don’t know for sure though. Thank you for this story. It’s another connection the 5th Air Force and the 11th Airborne had together!! We were hoping you’d enjoy the overlap! Off topic – didn’t the Japanese have a recovery program similar to ours for their pilots? Not sure. Why do you ask? A reader had asked, and i wasn’t positive of my answer, I wasn’t sure either. I’d heard stories of them picking up their pilots, but not on the level that we did. This is an excellent question. I hope someone has an answer. My grandfather, Lt. Andrew Carrico III served in the 511th PIR and was good friends with Lt. (soon Cpt.) Hoadly Ryan. Cpt. Cook, Lady Luck’s pilot, actually came to one of the regimental reunions many years later to meet with all the old paratroopers and tell his side of the story. Cook explained that it was his personal belief that his copilot had stood on the brakes which caused the difficulty getting proper takeoff speed which led to the ensuing crash. I have been researching the regiment for over six years now and my book on the Angels will be published this year (2019). Keep an eye out for it on the shelves! Thanks for sharing that perspective. Wishing you success in your book sales! The 11th Airborne Division need not speculate any longer as the 5th Air Force prepares to move them to Okinawa! Thanks to the historians of the IHRA, we can now have some answers. Had he been able to lift the wheels just a few inches off the runway earlier they would have made it. Landing would have been a challenge though. Thanks, GP. An unfortunate accident so close to the end of the war. So unfortunate. No way to know the brakes were locked. Of course, the airspeed indicator woud have been a hint that the runway was now too short for rotation. In emergencies the obvious is missed many times. The little know tragedies like this in the closing days of war are so unexplored, but important, if nothing else to the men involved and their loved ones. Thanks for posting. Thank you for sharing this. We must always remember those who served and those who gave the ultimate sacrifice. Thank you for reading their story. That’s so awfully sad. The men who ran into the fire to save their comrades were real heroes. It takes a lot of courage to run toward danger to save a life, even if it means sacrificing one’s own in return.